This is the Scotto Family 5th generation's newest milestone, their first tasting room! Located on South School Street in the heart of downtown Lodi, Scotto's Wine & Cider is one of the newest additions to Lodi's thriving wine scene. And like many things involving this innovative Lodi based family company, their tasting room offers something unique - in addition to their award winning wines, they also pour their very own, true craft ciders. The Scotto's know that wine and cider taste best with food, so a rotating assortment of tasty treats are available. 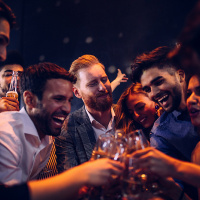 If you’re looking for a vibrant, fun and exciting nightlife scene, you’ve found your next vacation destination! There are plenty of things to do after dark and lots of options for you night owls.